I guess I’m kind of the new kid on the block. I’m Larry Bennett, and I was hired by Meg Chapin to manage her apple orchard. She had a manager before, but Bree got a great offer to work in Australia for a while, so she left right after the harvest season. Christopher Ramsdell, who works at the university, recommended me to Meg, so I’ve just started working at her orchard. There’s not much to do this time of year—it’s February in western Massachusetts, and it’s still cold. The first thing we’ll have to do is prune the trees, and see which ones aren’t doing so well. But they’re not ready yet. Meg and her husband Seth were nice enough to give me a place to stay, as part of the job. Seth owns a house up the hill, and I’ve got a room there. I’ve also got three roommates, which takes getting used to. I think Seth realized I felt kind of overwhelmed, and he suggested that we could build a Tiny House, big enough for one person to live in. Seth does a lot of carpentry and house renovation, so it’s easy for him to put it together, and if things don’t work out, it’ll be a good sample of what he can do for future customers to look at, or it might make a good playhouse for his sister’s kids. I’m happy to help him build it. I’ve never really had a place to live that was all mine. So we were waiting for the weather to warm up, and planning for the coming growing season, and things were looking pretty good—until Seth found the body of a woman at one end of the property, back in the woods. She’d been shot in the back, but it’s still hunting season, so it might have been a stupid hunter who didn’t check what he was shooting at. But nobody really believed that. So why are the police being so weird about saying who she was, and who might have killed her? 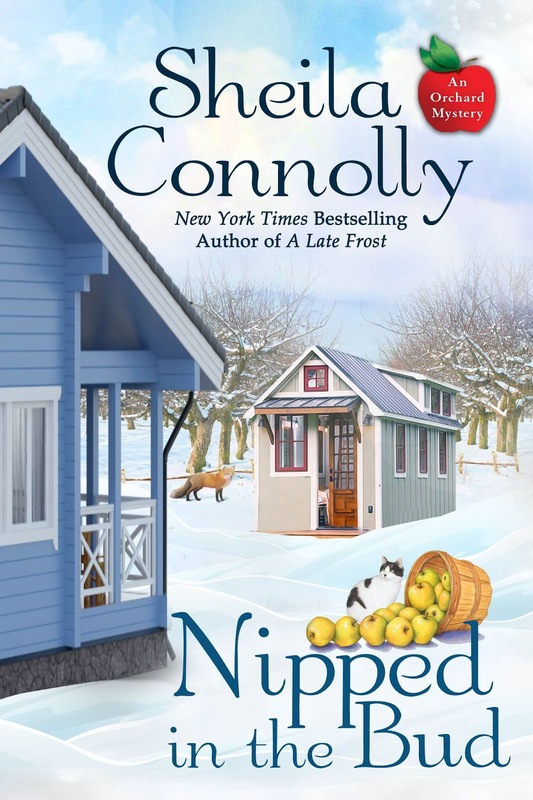 I'm happy to tell you that the Orchard Mysteries are back, with a new publisher (Beyond the Page Publishing), in both print and e-formats, and Nipped in the Bud is available for pre-order at all the usual places. The book will be released on October 29th. Congrats. I hope to read it. I LOVE this series and can't read to read it. I think I could live in a tiny house. I would definitely give it a try! I can see them for someone who reads but used a kindle or other e reader. For the ancients amongst us it wouldn't do. We'd need a 2nd unit 4 or 5 times the size to house our libraries. Oh, and yes, please enter me in the giveaway. LOL Sadly I only own thirteen of your books spread over 3 series. I like coziness, but they are a bit too small for me. Perfect for some but not for me. I'd love to try it if I were by myself. Don't think I'd manage sharing the space. I like the idea of a tiny house, but it definitely would not work for me. I think tiny houses are adorable. I'd like to try one out for a vacation, but don't think they'd work for me for every day life. I love tiny houses! So glad this series is continuing. About five years ago I downsized from a 2,200 sq. ft. home to one just over 1,200 sq. ft. and it was quite an adjustment. While I think Tiny Houses are adorable, I don't think I would be happy living in one. Crud. I just shared a childhood story that I don’t have the patience to retype. Google is playing with me again! I love the tiny houses...but I could not live in one. I’d be happy spending many waking hours in one, with my feet up and reading though...especially if I had easy access to uhhh..facilities and a small fridge for iced tea...and an electric teapot for hot tea! Crap. And I forgot the email address again...LaFonRC@aol.com.im the one who commented about reading, feet up, facilities, and tea! They're cute, but not for me. I have too much stuff I can't part with. Thanks for the chance to win. As someone who hates housework, I can see the upside of a tiny house. I love the idea of a tiny house but I'm not sure I could ever downsize enough to live in one. I would love to have such a tiny house. Perhaps at a lake or at the sea. :-) We live in an apartment house but having a house for myself with a garden, even if it's really small, would be a dream come true. My email is renate (at) mcmartin (dot) de. 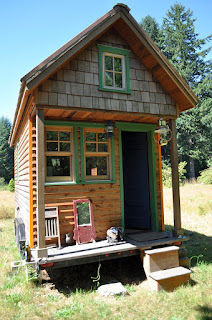 I would love a tiny house to use as my She-Shed but I don't think it would hold all my books and craft items. lol! I do love the idea of owning less and living life and not living to purchase "stuff". We recently moved to our dream destination (pray it's or last move because this one about killed me) and built our dream home. Although not a tiny home as what you think of when you say tiny, it is smaller than our previous home. We only have one bedroom and one big closet. It meant going through our "stuff" and figuring out what to keep and what to get rid of. It was especially hard after having inherited both my parent's and grandparent's "stuff". It was only realizing that that was exactly what it was - stuff. Just because someone owned it that we loved doesn't mean that we should love their stuff. It was quite liberating to downsize and unload what we didn't need or deem of great value to us. Thank you for the chance to win a copy of "Nipped in the Bud". Love the cover and can't wait for the opportunity to read about Larry Bennett and the rest of the people in the book. I love Tiny Houses. I watch the show on HGTV all the time. I think one would be perfect if you bought some property and use it on vacations. For every day living I need something bigger. I would love to live in a tiny house. I think they were made for me.